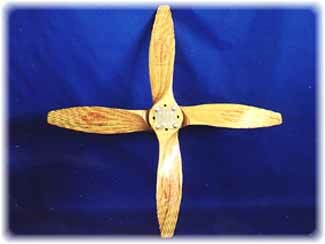 Our propellers are built to unprecedented standards of workmanship with a multi layer laminated block of the finest maple and birch. Then we meticulously craft each and every propeller until it has met our Quality Control expectations. Using a multi layer laminate, versus the common 2 to 3 layer block ensures that you are using the most durable product in the marketplace. As a finished product you have a choice of 2 styles, each with 3 1/8" diagonal spacing. Our most common propeller is the 2 blade propeller, which is extremely effcient and will exceed the expectations of most customers. The multi layer laminate not only adds to the performance of the propeller, but if used properly will last for years. The finest propeller Mach Zero builds! The 4 blade propeller has been designed to provide maximum performance each and every time. This highly engineered propeller delivers maximum output and you should expect to see an increase of almost 40% over our 2 blade propellers.